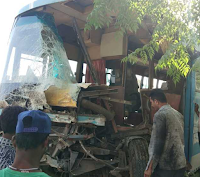 About 30 employees of a pharma company were injured as the bus they were travelling in rammed into a speeding truck at Marrawala village on the Baddi-Nalagarh highway on Friday morning. The staff bus was on its way to the company office. The bus was carrying the staff from Panchkula. The injured staff after receiving preliminary treatment at a local hospital was referred to Alchemist Hospital in Panchkula. Haryana Police are looking into the cause as the mishap took place on the Haryana-Himachal border.